Pola was the daughter of the late Francisco and Carmen (Simal) Fernandez, who emigrated from Spain to the U.S. She was one of three sisters, along with her twin, the late Flora St. Leger and late Lina Gurtowski. 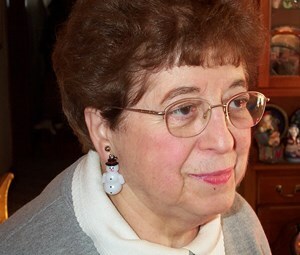 Pola was a teacher at East Syracuse-Minoa CSD and taught hundreds of students how to read. She will always be known for her love of dry Rob Roy drinks and traveling. Survivors include her nieces and nephews, Joan (Tom) Speziale, Frank (Elizabeth Demers) St. Leger, Jim (Audrey) St. Leger, Judy (Marc Kratzschmar) St. Leger, John (Shelley) St. Leger and Jennifer (David) Carlin, Stephanie Gehrig and Stephen (Trish) Gurtowski along with many great-nieces and nephews and her cousin, Avelina Miguel. A memorial service will be held on Saturday, September 8, 2018 at 3pm at New Comer Cremations & Funerals, 343 New Karner Road, Colonie. A private burial will be held at Memory Gardens in Albany. Add your memories to the guest book of Hipolita Fernandez. Although I was never in her class, I remember Miss Fernandez well. My mother , who was "room mother" for my class with Miss Kaiser, would sometimes be at school after hours. I recall them chatting together, in English and Spanish, as my mother was also the daughter of Spanish immigrants. After all these years I still remember Miss Fernandez's kindness and friendly smile. [I was in the graduating class of 1966.] My condolences to all her family and friends. I was fortunate to have Ms. Fernandez for both 3rd and 4th grade at Minoa Elementary School. She was my favorite elementary school teacher. She did come to our 20th high school reunion back in 1990. It was wonderful to see her back then. My sincere condolences for her family. Our lives were permanently enriched by getting to spend time with Pola. She was always happy to share recipes, news and insights in a way that few could match. The Christmas eve gatherings at Pola's were always a special treat that we looked forward to. She welcomed us as family from the first day we moved into her dear friend Anna's home. Thank you for your loving friendship, you are forever in our hearts. I was so sad this morning to find out that this world has lost Miss Fernandez! She was hands down my favorite teacher and the biggest reason I became a teacher myself. Our family had a very tragic summer just before I began 5th grade with Miss Fernandez in the Minoa Firehouse. She helped me get through a very hard time with love and compassion, while requiring me to work hard. I was with her when we got the news that President Kennedy had been mortally injured. She handled that situation with comfort and understanding. She also bowled on the teachers' league with my parents and grandmother. We had such fun seeing her outside of class! After I became an educator, I had the privilege and honor of actually teaching with her at ESM. However, I could never call her by her first name. I learned so much from her and she was a fabulous teacher. A couple of years ago, I traveled to the Albany area and spent a day with her. We had a delightful time! We spoke on the phone several times and always exchanged Christmas cards. I also have a mortar and pistle from her collection in an honored place on my fireplace mantle. I am warmed by her memory and will always owe a huge debt of gratitude to her for all she helped me accomplish. She never allowed me to even think about taking the easy road and for that I am forever thankful. Much Love to You and God Bless You, Miss Fernandez!!! I am so sorry to hear of Miss Fernandez's passing. She was my favorite and most memorable classroom teacher - my 5th grade teacher at Minoa Elementary, and the favorite of SO MANY. My brother Michael loved her too, and had her for both 4th and 5th grade -- in the Minoa firehouse! I am glad to have given her a call a couple of times in my adult life and had a particularly long and fun conversation a "couple" of years ago. But, I am sorry that I never made the move to visit her in person with my mother. I remember the demonstration speeches and hands-on projects we did, the stories we read ("The Ransom of Red Chief"), and her insistence that we "look it up". Especially memorable was the Hawaiian Luau, and the food we made at her house with pineapple in it for the big event. She was an excellent teacher, and she was special. Please accept my sincere condolences, and those of my mother Phyllis Irwin and my brother Michael.